The British artist is best known for his provocative, often grotesque, illustrations. 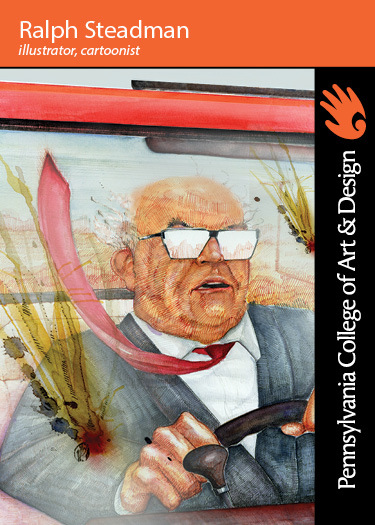 Ralph Steadman frequently features a ferocious tangle of ink blotches and lines that famously distort but also reveal their subjects. Though his earliest work did not reflect the biting, and unique style he became known for, Steadman’s content has always had a satirical bent, rendering visions of highly controlled madness. His partnership with Hunter S. Thompson was an easy artistic chemistry that allowed Steadman to channel the writer’s perceptions through depictions of his own work, putting his style of drawing into the mind of Thompson’s writing. Today, you can learn about the artist’s career through his documentary released this past Spring, For No Good Reason, or pick up a copy of his new book on bird drawings, titled Extinct Boids. Renowned for his political and social caricatures and cartoons. Has illustrated such classics as Alice in Wonderland, Treasure Island, and Animal Farm. Moved to the United States in 1969. His work has been strongly associated with “gonzo” journalist Hunter S. Thompson, illustrating several of his books including Fear and Loathing in Las Vegas. Voted Illustrator of the Year by the American Institute of Graphic Arts in 1979. QUOTE: “I am an artist, I trade in uncertainty and superstition and cant. I invent dark visions of impossible situations that can never be resolved."